Marx has proved to be a poor prophet of future events. Some of the predictions of Marx have proved to be true while others have proved wrong. His prediction regarding the increasing hold of monopoly has been proved to be true by later events. But his other prediction regarding continuous misery for the working class under capitalism has proved to be wrong in countries where capitalism has been successful. In countries of Western Europe and the U.S.A. the standard of living of the worker has been steadily rising and not falling. lie had predicted that the relative share of wages ill the national income would decline and the economic condition of the workers would deteriorate. But this has not happened. Empirical research has shown that in the countries in the pre-capitalist stage, labour’s share in the national income has remained constant and, as Marx had said, there has been no decline in this share either. In the capitalist countries, labour has got-sufficient share in the increase ill physical i nI as taken place on indicated by strong and growing ollar account of technical progress and capital accumulation. As a result, there has been marked improvement in the living conditions of workers. That is why they arc now less revolutionary than he fore.there no evidence of decline in the rate 01″ profit. It is in view of the Ilftlining rate of profit and concentration of purchasing power in the hands of a few people that Marx had predicted that capitalism would face crises off and Oil. and capitalism would ultimately an end. The actual events have gloomy predictions of Marx. It IS true that trade cycles keep recurring in the capitalistic economics. But in spite of short-term ups and downs, the capitalistic economics made a very rapid economic progress ill the st 100 years and it is on account 01″ this that these countries became affluent. Prof.Patterson has rightly remarked that Marx had thought that capitalism would rapidly disintegrate on account of ever recurring serious crises and it would finally and completely end on account of revolution by labour. and communism would be ushered in this way. Marx had not only wrongly predicted about the behaviour of labour’s share in national income but also about the long-term lop length of capitalism. Moreover, there are several theoretical Ilaw> in the Marxian theory of declining rate of profit as a result of’.a change in organic composition of capital. Some writers have said that the law of declining rate of profit cannot be derived from the law of increasing organic composition of capital. Since Marx assumed that the real wages of labour remained stable at the subsistence level, there will be great increase in per capita productivity as a result of increase in the organic composition of capital owing to capital accumulation and technical progress. The ‘ate of profit will also increase on account of real wages remaining constant at the subsistence level and rapid increase in the surplus value earned by the capitalists. It is worth noting Prof. Kaldor ‘s views in this connection. 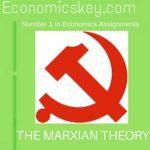 He says: “Since, Marx assumed that the supply price of labour remains unchanged in terms of commodities, when the organic composition of capital and hence output per head ises,there is no more reason to assume that an increase in organic composition will yield a lower rate of profit than a higher rate. For even if output per man were assumed to increase more slowly than (“constant” plus”variable”) capital per man, the “surplus value” per man (the excess of output per man over the costs of reproduction of labour) will necessarily increase Faster than output per man, and may thus secure a rising rate of profit even if there is diminishing productivity to successive additions to fixed capital per unit of labour.”Finally. Marx’s theory of income distribution is based on the labour theory of value which is not accepted by modern economists. Marxian analysis of surplus value or the exploitation of labour is obviously based 011the concept that aggregate value is produced hy labour. and capital only transfers its value to the value (11″ the commodity. Capital makes a significant contribution to productivity and substantially adds value. To deny this IS only to show one’s bias. Resides. the labour theory of value is only a form of the cost of production theory. As marshall had said long time hack. only costs of production (cost of labour together with cost of capital) do not determine value. Price of a commodity also depends on its marginal utility or demand for it. 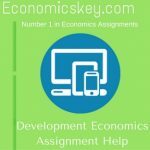 The price of a commodity is determined by the interaction of the forces of demand and supply. Hence. Marx ‘s view that the value 0 modality is determined by that labor time wrung and the modcru nut accept it. 1 hus, if the labour theory 01 value the theory ‘ surplus value or proved he wrong .